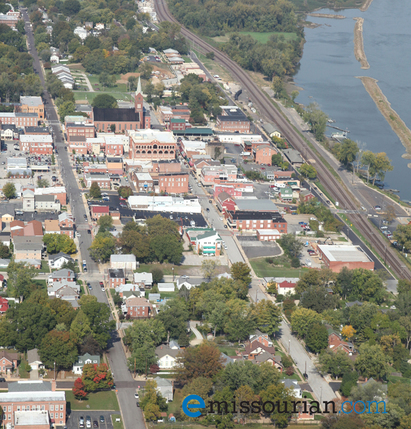 Washington is located on the south side of the Missouri River, just 40 miles west of St. Louis, at the junction of state highways 100 and 47 and is the site of one of the few bridges over the Missouri River. It is less than an hour’s drive from St. Louis via Interstate 44 or 70. Washington’s restored 1923 railroad depot receives Amtrak service, from St. Louis and Kansas City, twice daily. The Washington Airport is located 1.5 miles north on Highway 47, offering a 5,000 foot long, hard surface runway. The airport is equipped with GPS and VOR Approach Systems and has aircraft fuel available onsite. Washington has a population of approximately 14,000 people with an additional 25,000 within a 10-mile radius. Washington prides itself on friendliness, hospitality and an enormous amount of community spirit . This community spirit is never more evident than when hosting the annual Washington Town and Country Fair. Washington area residents volunteer their time and talents to bring you Missouri’s third largest fair, held the first Wednesday through Sunday in August. Shopping is a popular draw to Washington. Washington’s German heritage is historically preserved in its downtown, which houses antique shops, boutiques, specialty stores, art galleries and a variety of fine restaurants in its historic buildings. There are also several wonderful shopping centers with nationwide stores represented. Washington’s location is central to Missouri Wine Country, where a multitude of wineries offer visitors a taste of vintage Missouri wines. Whether you’re an outdoor enthusiast or novice, you’ll find the abundance of outdoor activities refreshing and invigorating. Washington’s City Park is home to an Olympic-sized public pool with a new kid-friendly swimplex addition. Washington offers fishing in lakes, streams and rivers, picnicking in the many parks, and walking, running, biking or skateboarding on our newest 3-mile riverfront trail. This trail is only a portion of an extended 12-mile hike and bike trail. For the golfer we have a number of first class, private and public courses along with a driving range. Tennis courts, as well as baseball, softball and soccer fields are in abundance throughout Washington’s 202-acre park system.